1GR8VACATION: A Day in Las Vegas! I know what you are thinking... Las Vegas on a FAMILY vacation! REALLY? I have to admit, the thought of spending much time in Las Vegas with my 14 year old son does give me caution. You see, for our family, Vegas was a means to an end. We wanted to visit southern California as well as Utah. The least expensive option for us was to fly into Las Vegas, so we did. We had one day, the day we flew home, to see the family friendly sights around Las Vegas. Our day in Vegas included a dam tour, magic show, and a water show. 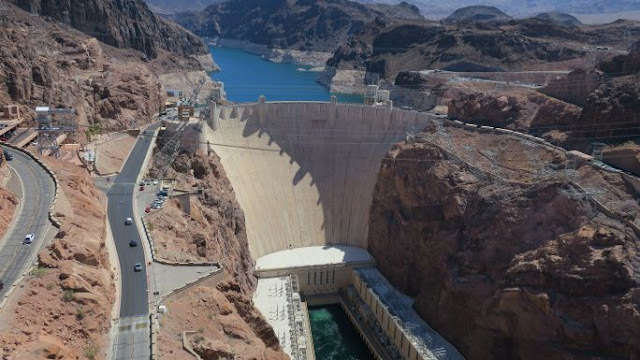 The Hoover Dam is located about 35-45 minutes from the Las Vegas Strip. This modern marvel can be seen for free or you can go on a dam tour. The dam tour as of June 2018 was $30 per person for a 1 hour tour and you had to be on sight to make a purchase, no online purchases permitted. You had to arrive early before the tickets sold out for the day. If you just wanted to see the visitor center the cost was $10 per person to go to the visitor center. I have never encountered that before! We did not go on a dam tour or pay to see the visitor center. Before heading down to the dam, we saw the dam from the Mike O'Callaghan-Pat Tillman Memorial Bridge. This bridge has a pedestrian walkway that is free. You have to walk up approximately 80 steps or take the ramp to get to the bridge. Mike O'Callaghan-Pat Tillman Memorial Bridge from the Hoover Dam. If you zoom in on the bridge you will see an 18 wheeler, that will give you a good perspective of how high the bridge is. Knees shaking just thinking about it. 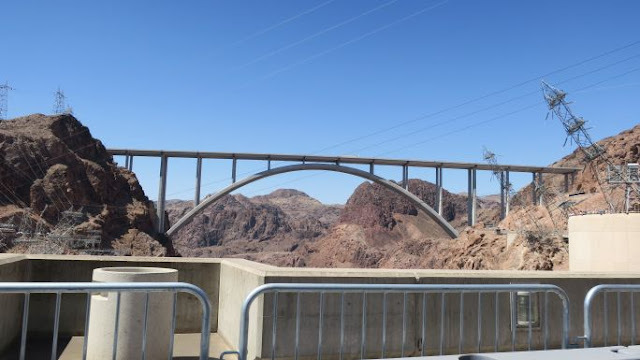 The Mike O'Callaghan-Pat Tillman Memorial Bridge stands 890 feet from the dam below. I have to admit my knees were weak when we were on the bridge, especially when an 18-wheeler truck passed. Hoover Dam from the Mike O'Callaghan-Pat Tillman Memorial Bridge. If you zoom to the base of the dam you will see cars parked, that should give you a good perspective of how high we stood above the water level. 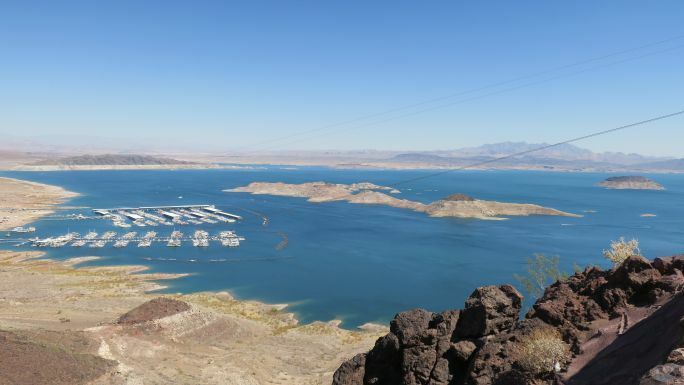 We learned the water level of Lake Mead was down 140 feet as of June 2018. Take a look at this photo & you can see just how low the water is. (The white rock you see is where water used to be.) We could even see this from the airplane as we flew into Las Vegas. The Hoover Dam was every bit as crowded as Disneyland! I could not believe how many people were visiting the dam on a 104 degree Thursday in June. When you go, prepare for it to be crowded. 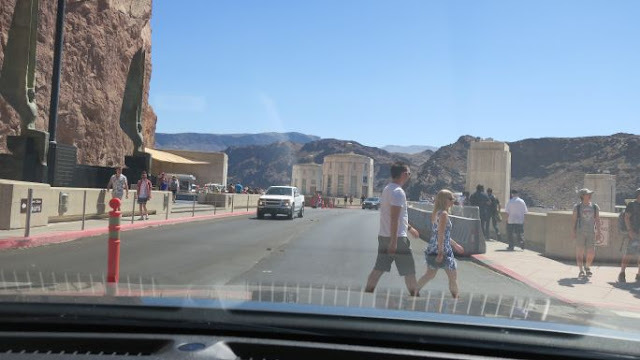 The Hoover Dam is REALLY crowded in June, even though it was 104 degrees that day! When you visit the Hoover Dam, you can pay to park in the parking garage for $10 IF it is not full. It is the closest parking to the visitor center. There are also parking lots located on the Arizona side of the dam that charge $10 (handicap is free) that are closer to the dam. If you go a short distance further into Arizona you will find FREE PARKING. We were able to get into the first FREE PARKING lot & the walk was about 3-5 minutes to the dam. Lake Mead from scenic overlook. Notice the water lines here. 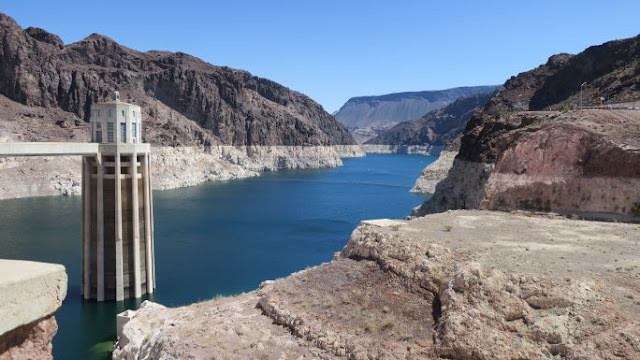 If you have not seen the Hoover Dam, this modern marvel is worth your time. It is awe inspiring to see! After our Hoover Dam tour we worked up quite the appetite. The closest restaurants were in town and were mostly fast food. We opted to eat once back in Las Vegas. We were not disappointed with our choice. 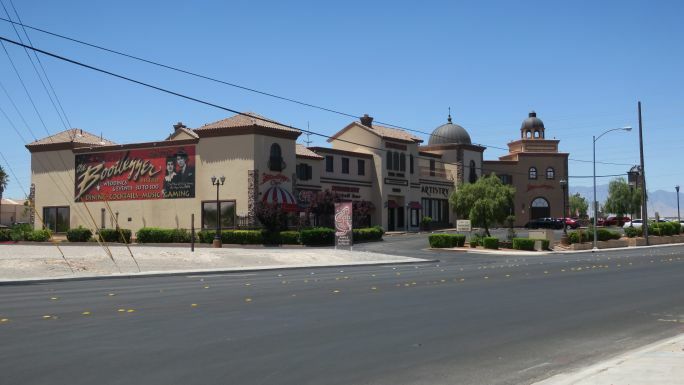 We ate at Bootlegger Italian Bistro in South Las Vegas. It was some of the best Italian food I have ever experienced. Lunch prices ranged from $15-$20, inexpensive by Las Vegas standards, especially for the quality of food. After lunch we headed over to Harrah's Las Vegas for the Mac King Comedy Magic Show. Mac King shows run about an hour and fifteen minutes and can be seen Tuesday through Saturday at 1 PM & 3 PM. My husband & I had seen Mac King when we visited Las Vegas a decade before & enjoyed his show. After reading reviews online I decided it was still family friendly as I remembered from years before and would be appropriate for my 14 year old son. 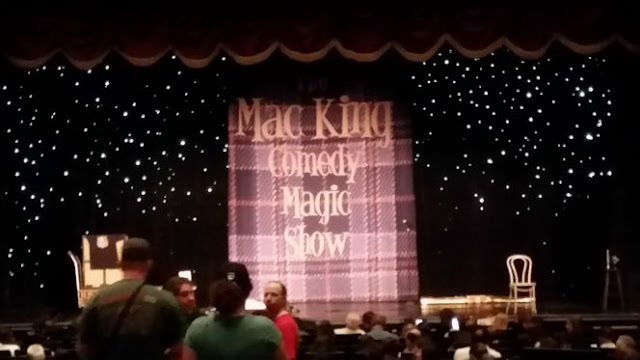 Mac King Comedy Magic Show located in Harrah's is a great show! Now let's talk money, after all we are on a budget right? If you purchase tickets online you are looking at it costing you $36 - $46 per person. BUT let me let you in on a little secret, if you go to the concierge desk at Harrah's you can ask for discounted tickets. Instead of spending $120 for 3 tickets online, we purchased the same 3 tickets for a total cost of $45. Oh, did I mention we also got 3 free drinks (alcohol or non-alcohol) with our tickets? Yep, that's right tickets to see Mac King AND free drinks too! We sat in the front center section for a great view of the show. Now for the show... Mac King is a legend! He is hilarious & talented in traditional magic. Mac King will not make a jet airplane disappear, but he will make you wonder how did he do that? The magic is presented in a comedic context with audience participation. The Mac King Show is suitable for anyone from 5-105! Some of his jokes are a little adult in nature but they go over the heads of the little ones. When you are in Las Vegas, make sure to spend an afternoon with Mac King over at Harrah's, you won't regret it. When you enter the parking garage you receive a ticket. You will need to take the ticket into the casino with you. As you leave the casino you will see a kiosk where you pay for parking. The cost to park as of June 2018 was 0-1 hour free, 1-4 hours $9, 4-24 hours $12. NOTE If you get the tickets for Mac King at the concierge desk make sure and read the drink ticket because I think I could have used it for free parking instead of a free drink. I thought of this AFTER I left the show. Oh well! After Mac King we headed over to the Bellagio for the fountain show. The fountain shows for Saturday & Sunday are every 30 minutes from 12 noon to 8 PM & every 15 minutes thereafter until midnight. Monday through Friday water shows are every 30 minutes from 3 PM through 8 PM & every 15 minutes thereafter until midnight. This FREE fountain display is set to music and lasts about 3 to 5 minutes. 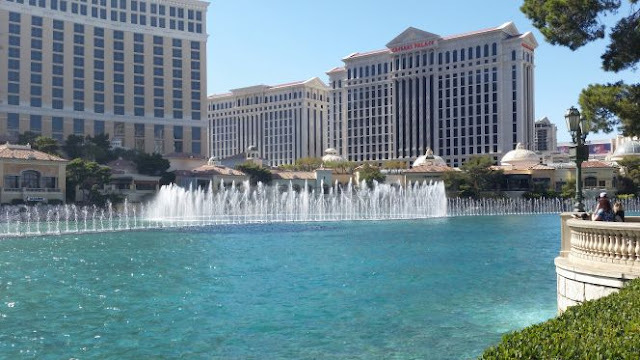 Don't miss the Bellagio fountain show when in Vegas. For dinner we selected Bubba Gump Shrimp Co. on the strip. I loved the Forest Gump decor! I loved the Forest Gump trivia game our waiter played with us while we waited for our food. Now for the not so good... Our waiter was terrible at waiting tables, he should have stuck with the trivia game. Even though our "STOP Forest" sign was turned, he made little effort to check on us during our dinner. The food was overpriced and not all that good. It certainly was not worth the $20 per plate we paid. Next time I think we will skip Bubba Gump Shrimp Co.
After visiting Las Vegas with my 14 year old son I would have to say I would not do that again. Las Vegas really isn't for children. I know what you are thinking... sin city, what happens in Vegas stays in Vegas, etc, etc, etc. What did you think was going to happen? Well... we spent very little time in Las Vegas, maybe 4 hours, on a Thursday afternoon so it was calm by weekend night standards. Even with the calm standards it just is not the kind of place I would take my 14 year old son in the future. Let the adults have Vegas and let the kids be a kid, elsewhere. Thank you for reading my blog. In the coming weeks I will post about our 3 fun filled days in Disneyland & 5 fun filled days in southern Utah. 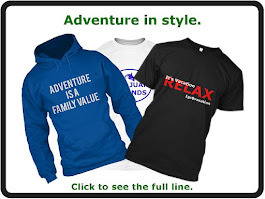 Subscribe to my blog so you do not miss a single post. May God bless you on your travel adventures!